MARSDEN HARTLEY, American painter and poet was born on this date (d. 1943); Born in Lewiston, Maine, at the age of 22, he moved to New York City where he attended the National Academy of Design and studied painting with William Merritt Chase. A great admirer of Albert Pinkham Ryder, Hartley would visit Ryder’s studio in Greenwich Village as often as possible. While in New York, he came to the attention of Alfred Stieglitz and became associated with Stieglitz’ 291 Gallery Group. He was in the cultural vanguard, in the same milieu as Gertrude Stein, Hart Crane, Charles Demuth, Georgia O’Keefe, Fernand Leger, Ezra Pound, among many others. Hartley, who was Gay, painted Portrait of a German Officer (1914), an ode to Karl von Freyburg, a Prussian lieutenant with whom he became enamored before his death in World War I. 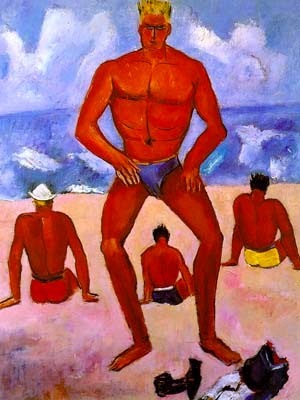 One of America’s earliest modern painters, Hartley was in Paris “at the creation” to be influenced by the Cubists and in Germany to be influenced by the Expressionists before developing an abstract style all his own (in true Gay archetypal form as the Interpreter and Mediator). Although he flits almost inconspicuously through the pages of the biographies devoted to his famous contemporaries, he has yet to be the subject of a major biography of his own. Strange, considering the company he kept. Among Hartley’s acquaintances were a telephone directory of contemporary Faes including William Sloan Kennedy, the biographer of Longfellow, Whittier and Holmes; Thomas Bird Mosher, the publisher of Whitman and one of the earliest American publishers of Oscar Wilde; Horace Traubel, Whitman’s secretary and the socialist editor of the Conservator; Peter Doyle, Whitman’s trolley conductor lover; Gertrude Stein; the American painter, Charles Demuth; writer and publisher Robert McAlmon, whose “notorious” Greenwich Village wedding to the Lesbian writer “Bryher” Hartley attended in 1917; actor George de Winter; writer Djuna Barnes; and poet Hart Crane – to name just a few. Although few seem to know it, Hartley was also a fine poet. His Selected Poems, out of print for almost 40 years, is worth rediscovery. The love of Hartley’s life was the above-referenced Prussian lieutenant, Karl von Freyburg, killed in a battle in 1914. This was Hartley’s great tragedy, an event mirrored in a series of contemporary abstractions that team with bold outlined forms, violent in color, and aggressively painted. The dead lieutenant was twenty-four (as can be seen referenced in the lower right-hand corner of painting, Portrait of A German Officer; Hartley was fifteen years his senior and grieved for the rest of his life.